It was long rumored that Sarah Burton of Alexander McQueen would design Kate Middleton's (now the Duchess of Cambridge) wedding dress, and in fact, it turned out to be true. Her stunning ballgown-style dress featured long lace sleeves, a daring plunging neckline with a sweetheart silhouette. Eschewing Diana's dramatic long veil and train, Kate wore a fingertip-length sheer veil and a relatively short train. The Dutchess chose British brand Alexander McQueen for the beauty of its craftsmanship and its respect for traditional workmanship and the technical construction of clothing. Kate wished for her dress to combine tradition and modernity with the artistic vision that characterizes Alexander McQueen’s work, and worked closely with Sarah Burton in formulating the design of her dress. The dress epitomized timeless British craftsmanship by drawing together talented and skilled workmanship from across the United Kingdom. The dress design paid tribute to the Arts and Crafts tradition, which advocated truth to materials and traditional craftsmanship using simple forms and often Romantic styles of decoration. Ms. Burton’s design drew on this heritage, additionally giving the cut and the intricate embellishment a distinctive, contemporary and feminine character. The lace appliqué for the bodice and skirt was hand-made by the Royal School of Needlework, based at Hampton Court Palace. The lace design was hand-engineered (appliquéd) using the Carrickmacross lace-making technique, which originated in Ireland in the 1820s. Individual flowers were hand-cut from lace and hand-engineered onto ivory silk tulle to create a unique and organic design, which incorporated the rose, thistle, daffodil, and shamrock. Hand-cut English lace and French Chantilly lace was used throughout the bodice and skirt and used for the underskirt trim. With laces coming from different sources, much care was taken to ensure that each flower was the same color. The whole process was overseen and put together by hand by Ms. Burton and her team. The dress was made with ivory and white satin gazar. The skirt echoed an opening flower, with white satin gazar arches and pleats. The train measured 8 feet long. The ivory satin bodice, which was narrowed at the waist and padded at the hips, draws on the Victorian tradition of corsetry and is a hallmark of Alexander McQueen’s designs. The back was finished with 58 gazar and organza covered buttons fastened by Rouleau loops. The underskirt was made of silk tulle trimmed with Cluny lace. French Chantilly lace was combined with English Cluny lace to be hand-worked in the Irish Carrickmacross needlework tradition. All other fabrics used in the creation of the dress were sourced from and supplied by British companies. The choice of fabrics followed extensive research by Sarah Burton and her team. The Royal School of Needlework (RSN), based at Hampton Court Palace, assisted the Alexander McQueen team in accurately cutting out the delicate motifs from the lace fabrics and positioning the lace motifs with precision into the new design. The lace motifs were pinned, ‘framed up’ and applied with stab stitching every two to three millimeters around each lace motif. The workers washed their hands every thirty minutes to keep the lace and threads pristine, and the needles were renewed every three hours, to keep them sharp and clean. The RSN workers included existing staff, former staff, tutors, graduates, and students, with the youngest aged 19. The RSN’s work was used primarily for the train and skirt of the bride’s dress, the bodice and sleeves, and her shoes and veil. The veil was made of layers of soft, ivory silk tulle with a trim of hand-embroidered flowers, which was embroidered by the Royal School of Needlework. It was held in place by a Cartier ‘halo’ tiara, lent to The Dutchess by The Queen. Kate chose a wedding dress that didn't require a necklace, thus avoiding the need for heavy or elaborate jewels. As a result, she still looked like herself and succeeded in keeping with her desire to be a modest princess. Prince William arrived at Westminster Abbey for the Royal Wedding looking relaxed and happy. Driven in a motorcoach, he sat next to his brother Harry with no visible sign of nerves. Many thought he would wear the navy uniform of the Royal Air Force where he is currently stationed. But instead, he opted for the more telegenic bright red uniform of the Irish Guards, of which he has a senior honorary appointment. He did not wear a sword or anything else one might expect of a Royal Prince, but he did whisper to his bride on first vision, "You look beautiful." His voice seemed steady as he said his vows, promising to love her, and comfort her, in sickness and in health. With his marriage, Prince William was also given a Dukedom. His titles conferred were Duke of Cambridge, Earl of Strathearn and Baron Carrickfergus. Prince William thus becomes His Royal Highness The Duke of Cambridge. 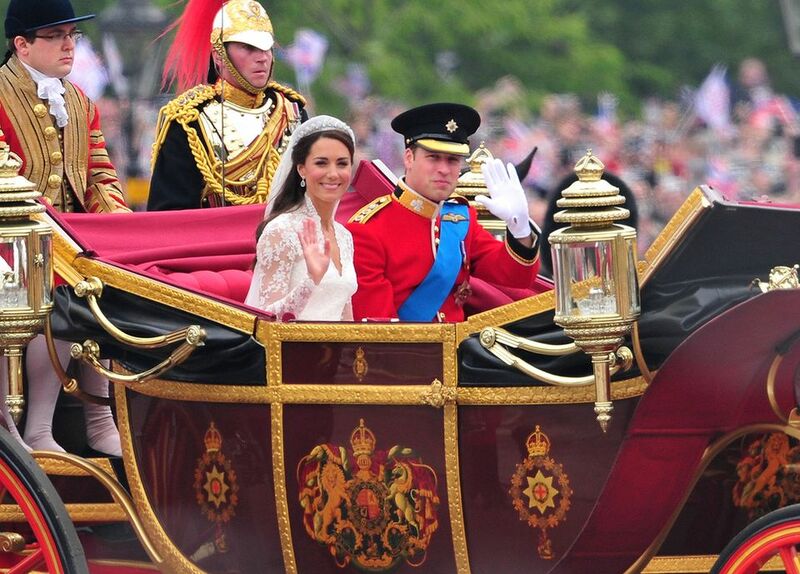 His bride is no longer Kate Middleton, but rather, Her Royal Highness The Duchess of Cambridge. She can also be called Princess William of Wales. On her wedding day, Kate Middleton's jewelry was the perfect touch for her to assume the title of "The New People's Princess." Of course, she wore diamonds and jewels, but not too many. Defying the rumors that she wouldn't wear a tiara, Kate's "something borrowed" was the Cartier 'Halo’ tiara. Made in 1936, it was purchased by King George VI for his wife, Elizabeth (later Queen Elizabeth The Queen Mother) three weeks before he succeeded his brother as King. The tiara was presented to The Queen, Elizabeth II by her mother on the occasion of her 18th birthday. As the tiara is part of the Crown Jewels, it can only be lent to Kate and will return there when she dies, or when the Queen requests. But though she may be called "Princess Catherine" by the public, Kate is still very loyal to her family. And so she chose to wear earrings given to her by her parents as a wedding gift. Made by Robinson Pelham, the earrings are diamond-set stylized oak leaves with a pear-shaped diamond set drop and a pavé set diamond acorn suspended in the center. The inspiration for the design comes from the Middleton family's new coat of arms, which includes acorns and oak leaves. Philippa Middleton, or Pippa as she's known, shone in an Alexander McQueen dress of her own. Her dress was sexier than the bride's, wearing a figure-hugging satin-based crepe dress with a deep cowl neck. As the maid of honor, her dress was very different than her sister's wedding dress but still echoed it with the same button detail and lace trims as the Bride's dress. Most Americans do not choose white for their bridesmaids, but it is more traditional in England. In the UK, the bridal party is traditionally made up of children, with one or two adult attendants to help with a heavy train if necessary. In Princess Diana's wedding, the young flower girls and junior bridesmaids wore dresses that closely resembled Diana's in miniature form. Queen Elizabeth seemed to reflect the happiness of the day in her all-yellow ensemble. The Palace released a statement saying, "Her Majesty The Queen is wearing an Angela Kelly-designed single crepe wool primrose dress with hand sown beading at the neck in the shape of sunrays. Matching double crepe wool tailored primrose coat. An Angela Kelly designed matching crepe hat with hand made silk roses and matching apricot colored leaves." Her jewelry included Queen Mary’s True Lovers Knot brooch and a double strand of pearls. As she typically does, she also wore white gloves, sensible heels, and carried a ladylike purse. When you're the mother of the bride or the stepmother of the groom, you want all eyes to be smiling on you without drawing attention away from the couple. Carole Middleton, the mother of the bride, and Camilla, Duchess of Cornwall, the stepmother of the groom, did not disappoint. Seen here with their husbands, the two women wore complementarily but not competing dresses. Camilla wore an outfit designed by Anna Valentine, including a champagne silk dress and a hand-embroidered blue and champagne coat. She paired it with a Philip Treacy hat, Jimmy Choo shoes, and an Anna Valentine clutch bag. The mother-of-the-bride looked gorgeous in a silk Catherine Walker sky-blue dress with pleated details. Over the dress, she wore a matching blue wool coatdress with embroidered details at the waist and sleeves. She also wore a hat by Berkshire-based Jane Corbett. Did you know the royal wedding cake is made of fruitcake? Though not a typical wedding cake flavor here in the U.S., fruitcake is traditional in England. From the outside though, it looks just like an expensive American wedding cake. This one, designed by Fiona Cairns, was made from 17 individual fruit cakes (12 of which form the base) and had eight tiers. The cake was decorated with cream and white icing using the Joseph Lambeth technique. There were up to 900 individually iced flowers and leaves of 17 different varieties decorated on the cake. A garland design around the middle of the cake matches the architectural garlands decorated around the top of the Picture Gallery in Buckingham Palace, the room in which the cake was displayed. Rose (Bridal) – Happiness, Love. Lavender – ardent attachment, devotion, success, and luck.